Jeffrey Ryan: Quartet No. 4, "Inspirare"
The Tokyo String Quartet has captivated audiences and critics alike since it was founded 40 years ago. 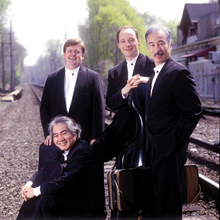 Regarded as one of the supreme chamber ensembles of the world, the Tokyo Quartet—Martin Beaver and Kikuei Ikeda (violins), Kazuhide Isomura (viola), and Clive Greensmith (cello)—has collaborated with a remarkable array of artists and composers, built a comprehensive catalogue of critically acclaimed recordings and established a distinguished teaching record. Performing over a hundred concerts worldwide each season, the quartet has a devoted international following across the globe. The ensemble performs on the “Paganini Quartet”, a group of renowned Stradivarius instruments, on loan from the Nippon Music Foundation, named for legendary virtuoso Niccolò Paganini, who owned them during the 19th century. The Academy of St. Martin in the Fields was formed in 1959 by a group of eleven enthusiastic musicians with the aim of performing in public without a conductor. Their first three recordings led to a succession of long-term contracts, and the Academy quickly took their place among the most recorded ensembles in history. As the repertoire expanded from Baroque to Mozart, Bartok and Beethoven, so it became necessary for the principal violin, Neville Marriner, to conduct the larger orchestra. The Academy of St. Martin in the Fields Chamber Ensemble was created in 1967 to perform the larger chamber works—from quintets to octets—with players who customarily work together, instead of the usual string quartet with additional guests. 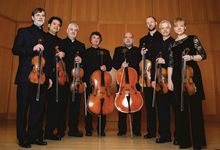 Drawn from the principal players of the orchestra, the Chamber Ensemble tours as a string octet, string sextet, and in other configurations including winds. Its touring commitments are extensive, with annual visits to France, Germany, and Spain, and frequent tours to North and South America, Australia, New Zealand, and Taiwan. Works by Schubert, Faure, Britten, Copland, Barber, and more. 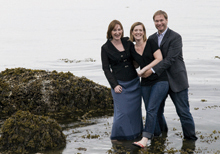 Martha Guth, Tyler Duncan and Erika Swtizer have performed together for CBC Radio, Montreal's André-Turp Musical Society, Toronto's Arts and Letters Club, Prairie Debut, Musicfest Vancouver and the Vancouver International Song Institute. For this recital they team up to present an exquisite program of songs inspired by water in all of its forms. 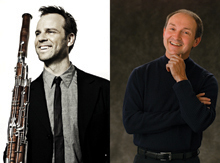 The trio brings their passion and humour to the stage, telling story after compelling story set to music by great composers ranging from Schubert and Fauré to Joni Mitchell and Stan Rogers. Internationally acclaimed pianist Jon Kimura Parker was born, raised and educated in Vancouver. Jon Kimura Parker has performed as guest artist with the New York Philharmonic, the Cleveland Orchestra, The Philadelphia Orchestra, and with the major orchestras of Atlanta, Baltimore, Boston, Cincinnati, Los Angeles, Minneapolis, and throughout Canada. He has given recitals in London, New York, Chicago, Munich, Budapest, Sydney, Hong Kong, and Tokyo and has performed with the Tokyo Quartet and Joshua Bell. This season Parker performs at the Beijing Music Festival, with the Atlanta Symphony, Dallas Symphony, Oregon Symphony and Seattle Symphony, in recitals with James Ehnes, Cho-Liang Lin and Lynn Harrell and in festivals across the country, including the Orcas Island Chamber Music Festival, where he serves as Artistic Advisor. Founded in 1965, over its 26-year history, The Orford String Quartet became one of Canada’s best-known and most illustrious musical ensembles. After more than 2000 concerts on six continents, the Quartet disbanded in 1991. In July 2009 the New Orford String Quartet arose from the fame and tradition of its glorious predecessor. 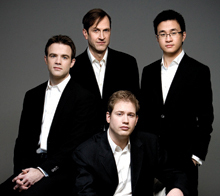 In the short time since its creation the New Orford Quartet has seen astonishing success. Hailed for their “ravishingly beautiful tone” as well as their “extraordinary technical skills and musicianship”, these like-minded musicians came together with a plan to revolutionize the concept of string quartet playing in Canada. The New Orford String Quartet is also dedicated to promoting Canadian works, each of its projects including performances of a major Canadian string quartet from the 20th century or a premiere of a newly composed work. Pianist Arthur Rowe joins them on this program for a performance of the Brahms Piano Quintet in F minor. 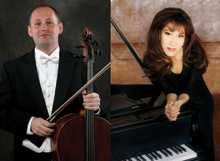 Russian-born cellist Alexei Romanenko and Canadian pianist Christine Yoshikawa delight audiences around the world with their highly vibrant musicality and technical brilliance. Equally in demand as concert soloists, the Romanenko-Yoshikawa Duo has distinguished itself as a combined dynamic team of artists with an impressive list of awards and personal achievements and has enjoyed debuts upon many of the world’s prominent concert stages. Presenting an exhilarating program of cello and piano masterpieces from classics to contemporary, they are advocates of new music and dedicated pedagogues to a generation of young musicians. Janácek, String Quartet No. 1, "Kreutzer Sonata"
First prize winners of the 2010 Banff International String Quartet Competition (BISQC), Canada’s Cecilia String Quartet has quickly attracted the attention of the chamber world at home and internationally. Praised for their “extraordinary commitment and maturity” (Gazette) and “‘talent, passion and mastery” (Jacques Robert, JR Multimedia), this young quartet is one of Canada’s most exciting young ensembles today. They are currently the Graduate Resident String Quartet at The Royal Conservatory’s Glenn Gould School. The CSQ has performed for some of the most respected chamber series internationally, such as Music Toronto (Toronto, Canada), The La Jolla Music Society (San Diego, USA), ProQuartet (Paris, France), and the Ottawa International Chamber Music Festival. They also toured Ontario, Quebec, and British Columbia with Jeunesses Musicales Canada on their Desjardins Concert Series. Estonian born bassoon virtuoso Martin Kuuskmann is a commanding force bent on rede!ning the bassoon as a top calibre solo instrument. His charismatic and entertaining performances throughout the world have earned him repute as one of the leading instrumentalists around. The New York Times praised Kuuskmann’s playing as “amazing bassoonist… dynamic…gripping…” and in 2007 he received a Grammy Nomination for his recording of David Chesky’s Bassoon Concerto.